Director Rian Johnson found the perfect collaborator in Joseph Gordon-Levitt. The duo first paired up for Johnson’s directing debut Brick in 2005, a high school-set drama slathered with film noir goodness. Now they’ve reteamed for the new sci-fi time travel movie Looper, another genre experiment with an emphasis on strong character dynamics. The two are all about immersion — in the case of Johnson, it’s about diving deep enough into a world that you can tackle a specific story. For Gordon-Levitt, it’s losing yourself in the role. 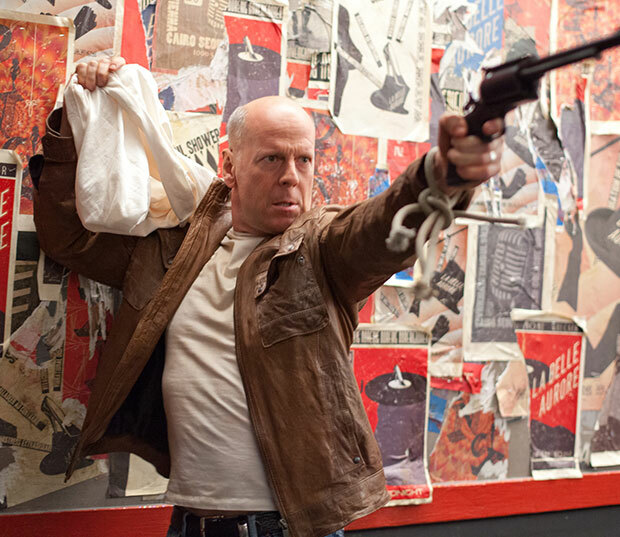 That’s never been more apparent for his work on Looper, where prosthetics and vocal choices turn him into a dead ringer for Bruce Willis’ younger counterpart. 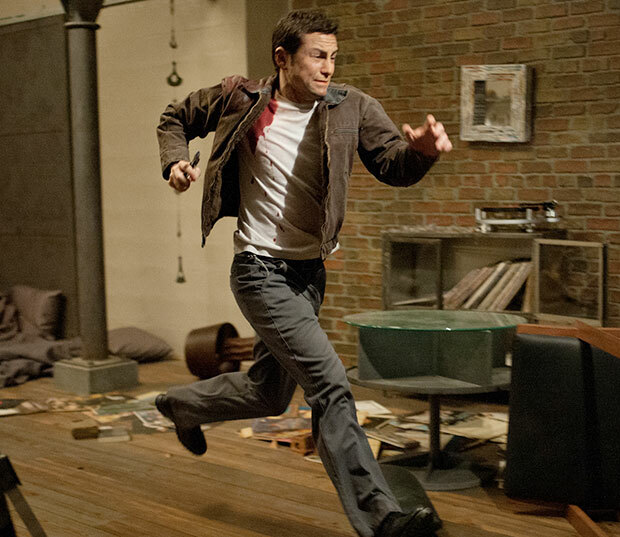 I sat down with the passionate gentlemen to discuss Looper, a film that follows futuristic hitman “Joe” (Gordon-Levitt) as he tracks down the target that got away: his future self. Do not fret: enjoying this interview, much like the film, does not require complicated time travel flowcharts to understand. What impresses me about the film is that there is a vast world existing behind the events on display. We get a whiff of it. 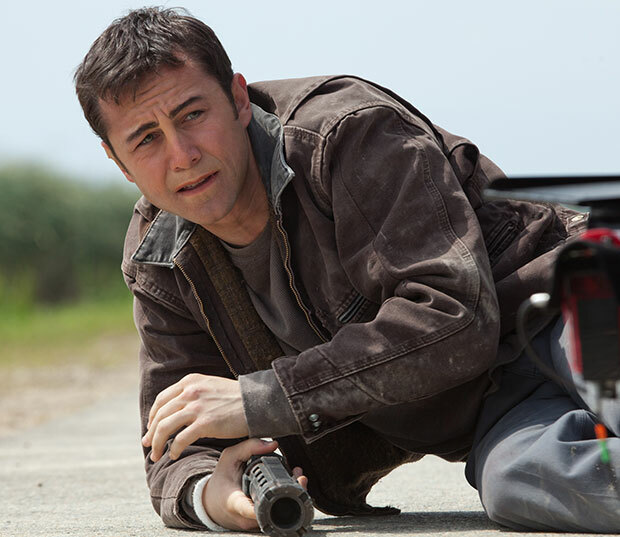 Was there a lot to flesh out in order to tell a story in the world of Looper? Was there a “Looper” protocol to be learned? Joseph Gordon-Levitt: We talked about that. We wanted it to be clear that even the first time you see him on the job, that it isn’t anything special, that it’s another day at the office. We talked about how he does it every day: he has these boots that he wears so he doesn’t get his nice shoes muddy — stuff like that. Rian Johnson: When he’s driving to work in the morning, he’s seen this 1,000 times. He doesn’t look twice at the guy who is shooting someone with a shotgun on the other side of the street. It was important to feel like we were stepping into a reality that’s existed for some time. Gordon-Levitt: But they’re fun conversations to have after the movie is done. I’m always really interested to hear people’s impressions. I hope you’re ready for endless Reddit threads of speculation and fan fiction. Gordon-Levitt: It is always fun to see that stuff. While I assume a sci-fi/time travel script is tough to orchestrate at the writing stage, are there difficulties in making a movie with heightened reality that emerge while shooting? Johnson: In terms of production, it’s the same thing in every film, whether it’s about time travel or its a drama. I rely on Joe, Emily [Blunt], the other actors to make sure every moment in the film feels honest. My job is to zoom back to make sure the big picture, the timeline, feels right and works. It’s our job on set to zoom in and each moment feels right. If there’s a moment of exposition, for example, these guys will tell me, ‘Why is the character saying this at this point?’ And if my answer is, ‘Because the audience needs to know it,’ then that’s not good enough. Joe, was there a moment that stood out to you where you had that question? Gordon-Levitt: Honestly, no. It’s finely written material and there weren’t moments in the script that felt fake like that. It’s not really one of those movies that is complicated in that way. For my character, the story is 100% linear. He starts as a sad, lonely professional killer. And he goes through this journey, and he ends up a changed man. Johnson: That was one of the first things I landed on approaching the time travel. We’re going to approach this very linearly. We’re not going to hop around much. There’s one [moment] where we go forward, but it’s to show the linear progression of Joe’s character. Thinking about it from this worm’s eye point-of-view of just this character’s experience of it, as opposed to zooming back to a timeline view, that was a central way of coming at it. Joe, your portrayal of “Joe” reminds me of a biopic. Your character feels less like an impression of the older Bruce Willis version, and more “inspired by.” Was there a fine line between the two for you? Gordon-Levitt: The goal was always to make a character that felt like the same guy, more than focusing on surface level things. Although I guess I did both, because I did try and get a version of his voice. I’m not an impression artist. I don’t have that talent like Jimmy Fallon or Jay Pharaoh, who is on SNL right now and is a really good impression artist. That’s just never been my skill. I wasn’t worried about getting too close [laughs]. Johnson: One of the things that you did that I thought was really smart, was looking at Bruce’s recent work versus looking at his younger work. So you could create a character you could buy as a younger version of that person, not imitating Bruce’s younger self. Gordon-Levitt: And not focusing on… I know the short way to say it is that I was playing a young Bruce Willis. But I’m really not. I’m playing a character who is the younger version of the character that Bruce Willis plays in the movie. By the way, the character he plays in the movie is quite a bit different than a lot of the stuff he’s done before. Were you able to collaborate with him on creating “Joe”? Gordon-Levitt: Yeah, I more took my cues from him, but we did come up with a few things. We talked a lot about the guy and his life, how he feels and where he comes from. When he was young, he was a junkie and a killer. Then he grew up, and this is how his life went. And this is how he feels about it. We had those conversations, and I think they’re really important. While it’s important to have the surface accuracy so that the audience understands it instantly, what’s more important is, as the audience watches it unfold, they feel the emotional consistency. What was the first scene you shot with Bruce? Johnson: It was about halfway through the shoot, and that’s what was really cool about it. We had been working with both of them separately for awhile when we got to that diner scene [Ed. : a sequence you can see part of in Looper‘s trailer]. And seeing the two halves finally click was really satisfying. Just for us and the crew, to sit there watching. [To Joe] For you guys, it must have been a payoff. Gordon-Levitt: That is really the scene that, from the beginning, even before we were lucky enough to get Bruce on board, we talked about that diner scene. We knew that was going to be the one that… we had to design this character so that when they’re sitting at the diner the audience understands. That was always a focal point. To actually do it was high stakes. Rian, what was the impetus for Looper? Was it an interest in sci-fi time travel or was that premise derived from a particular emotional journey? Johnson: The starting starting was I wrote, ten years ago, a short film I never ended up shooting. It had a similar premise and resolution, but it didn’t have any of the Sara stuff. So it was kind of a three page script with a sci-fi premise. When I picked it up again after The Brothers Bloom, the thing that turned it into a movie was what you were saying: figuring out… theme sounds like a dusty word, but it was figuring out what the human element was going to be. It’s almost like looking for a missing puzzle piece — you’re looking for a place to get to that this sci-fi element is going to work perfectly with and amplify. When I found that, the whole thing took off. Speaking of amazing actors, you have a kid in this movie who is absolutely terrifying. Johnson: Pierce! Pierce Gagnon — he’s a real actor. Gordon-Levitt: He’s nothing like that in real life. That’s important to mention. When we knew we were going to have a kid, I remember saying to you, ‘We’re not just going to hire the kid that looks right!’ That does tend to be what happens in movies. The assumption is made that a kid couldn’t really act, so just hire the cute one or the kid who needs to look however he needs to look. Johnson: Then trick him into giving a performance. Gordon-Levitt: Yeah, and cut it together. But I firmly believe kids can be as good as anybody, if not better. They’re not saddled with a lot of the self-consciousness we are. They’re used to playing with their imaginations. That’s really what acting is. Johnson: I remember in rehearsals I gave him a bad piece of ‘little kid’ direction. ‘Look sadder at this part.’ When you say ‘look sadder,’ it’s direction any adult actor would kick you out of the room for. Pierce looks at me and says, ‘I don’t know what that means.’ That was an actor I needed to work with. Rian, do you see a connection between Joe’s two characters in Looper and Brick that made him the man for both parts? Johnson: Even though I was writing the part for Joe, the character is nothing like my friend Joe. Besides wanting to work with my friend, largely the reason I knew Joe was absolutely the right man for the job was because of the transformation it would require. He loves it and excels at it. He loves four hour makeup jobs? Johnson: Have I told you lately that I love you? You’ve witnessed that first hand working on Lincoln. Gordon-Levitt: It was uncanny to see. Those are my favorite ones. Which isn’t to say I don’t also like… Cary Grant tends to be the same guy every time and I like him. So it’s not a rule. But I tend to like the chameleons.